World Champion Free Diver, Guinness record holder, and online entrepreneur. Stig is the first person in the world, to hold his breath for more than 22 minutes! He is also the one that has swum the longest distance under ice, just wearing a set of speedos in an ice cold lake in Greenland. On most of these projects, FOTOGRAFIT has been part of the documentation. Stig and I have been many places all over the world both filming and walking miles up and down dive show floors. The relationship goes years back and sponsoring Stig with cameras housings, lights or friendly advice has been both rewarding and fun. Despite being extremely busy traveling and doing business all over the world, Stig is very active as an advisor for the development of FOTOGRAFIT. 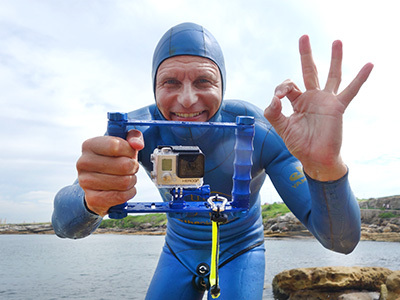 Not many people know this, but Stig has always been an extremely good underwater videographer. Using his freediving techniques he has been able to both get very close and keep the camera very still during countless TV productions.